If you live in Barcelona or planning a visit to the Catalan capital, this amazing city is a perfect base for amazing day trips around Catalonia and north-west Spain. Everything from picture perfect beaches to wineries to snowy mountain tops is within easy reach from Barcelona and you could spend weeks being based in the city visiting new places every day. 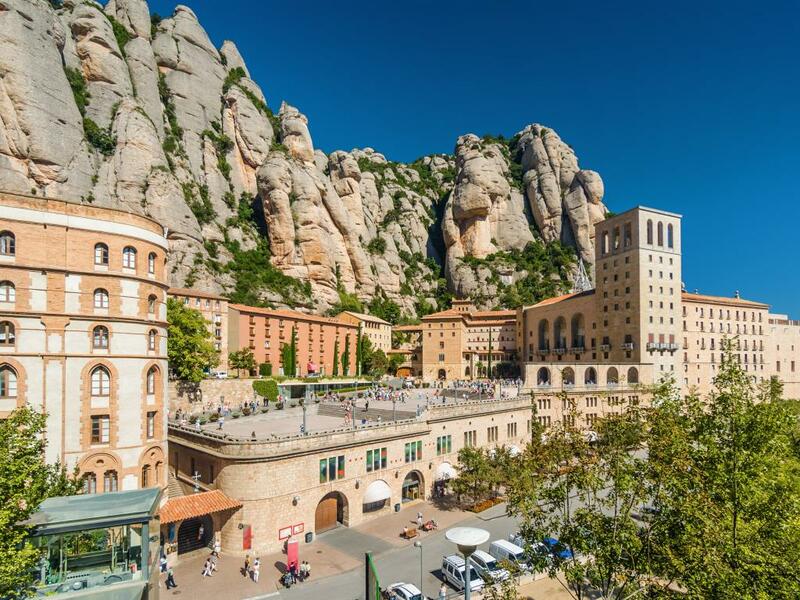 If you are in Barcelona and have one day spare, the Montserrat Monastery is the place you should visit. Tucked into the mountains a short drive away from the centre of Barcelona, this is an active monastery with 70 monks. Founded in the 11th century, a lot of the monastery was rebuilt in the 19th and 20th centuries. You can drive up or take the cable car to get up to the highest point of the Catalan lowlands. There is a huge amount to see inside - the monastery is open from 9am to 7pm on weekdays an closes at 8pm at the weekend. The museum hosts a fantastic collection of art with works by Dali, Picasso, El Greco and others on display. There is an hourly train from Barcelona's Plaça Espanya Station that take you all the way to the monastery. You can get all-inclusive tickets that cover admission and lunch for about €50 per person. Ticket office closes after lunch so you'll need to get to the station in the morning. Both, the drive and the train route are spectacular with a lot of mountain views and scenic vistas as your approach. A museum and Throne of Our Lady close a bit earlier so don't leave your trip to late on in the day. 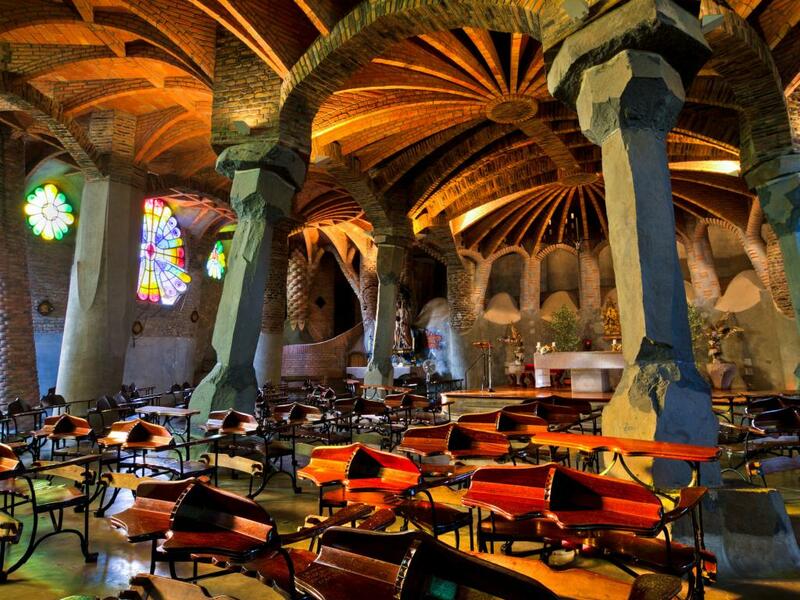 Located just outside Barcelona, the Colonia Güell is an industrial village set in the Santa Coloma de Cervello. If, like us, you're not sure what an industrial village actually is, it's the place where Eusebi Güell set up his textile mill, complete with dwellings for the workers, a school, a church, shops and everything else a small community needs. Güell was an entrepreneur in late 19th to early 20th century and worked a lot with the world famous Antoni Gaudi. The village project was eventually abandoned, but you can still visit and a lot of it has been preserved to this day. The main sight is the unfinished church - a grand project by Gaudi to build a non-conformist church for the local settlements. As Güell's money ran out, only the Crypt and lower parts of the facade were completed, but it is still worth seeing for the architecture that's there. There are local trains running from Placa Espanya if you want to take public transport instead of driving. The public transport option will get you there in 40 minutes which makes it an easy short day trip. 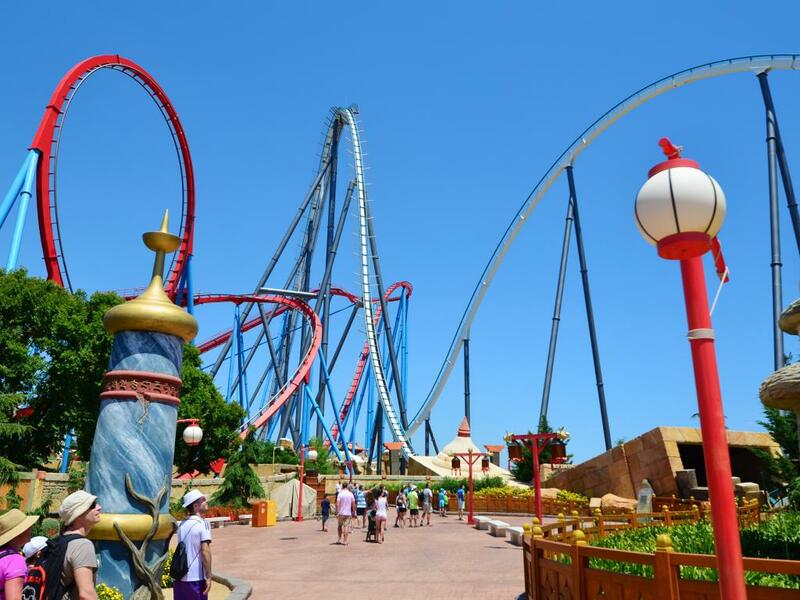 The PortAventura Park in Salou, just south of Tarragona is the most visited theme park in Spain and a fantastic way to spend a day out if you are staying in Barcelona. It takes just over an hour to drive or you can get the train - the PortAventura Park is so big it has its own train station! There are some epic roller coasters here including the Dragon Khan which until recently held the world records for the tallest vertical loop and the most inversions. Then you have the Shambhala (goes up to 134 km/h) and Furius Baco (up to 135 km/h) and a tonne of other amazing rides. I mean come on. They have a ride called the Furius Baco. How cool a name is that? Aside from the big attractions, there is plenty of fun and games for kids and the whole family - I first visited when I was a young kid so if you are in Barcelona over the summer, I'd highly recommend going. There are other parks in the same location including the Ferrari World and the Aquatic Park. I'd recommend you head for the main attraction - there is plenty to do! While the park is normally open until 7pm, in July and August rides are open until midnight and on festive days closing time can be as late as 2am. This ancient monastery was once the most important and powerful in the county of Barcelona. Founded in the 9th century, most of the monastery was build by the 14th century. It was built on the ruins of a church where Saint Cugat had been buried and named after him. 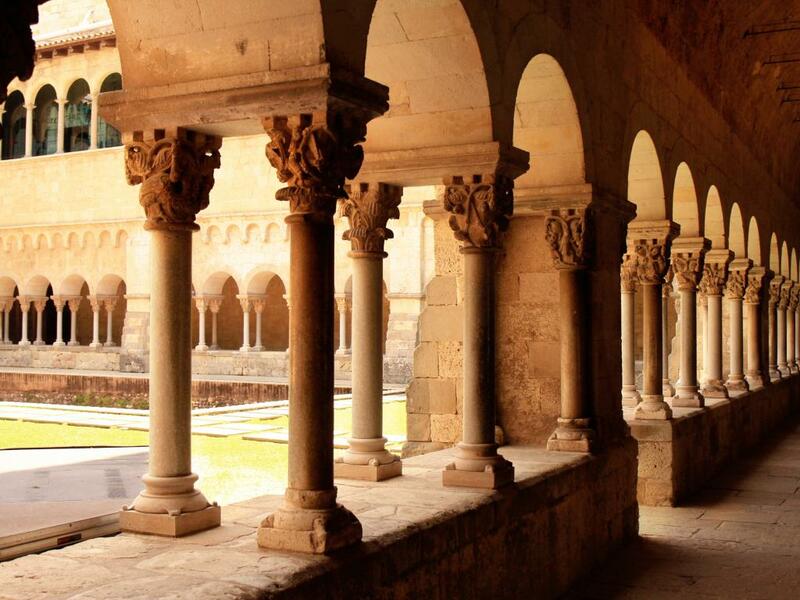 The Sant Cugat monastery is only a short drive out of Barcelona and displays amazing medieval architecture. The church is very well preserved and is a classic mix of Romanesque and Gothic styles. There are a number of parts to this monastery that are open to visitors including the Abbot's Palace, the Main Hallway and the perimeter walls. 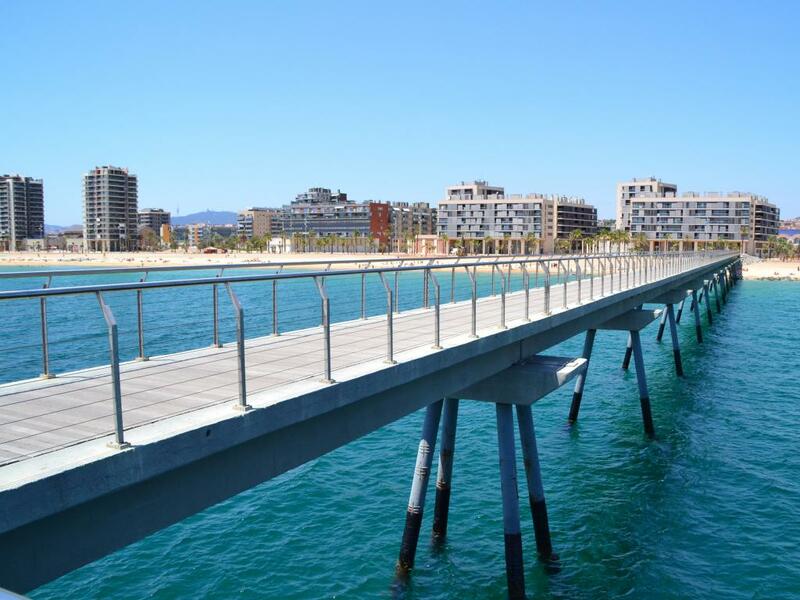 You might guess from the way it sounds, but Badalona is closely linked to Barcelona. In fact it's really become Barcelona's north-eastern suburb and shares a lot of the culture. You can get to Badalona on the train or metro so even if you have a hire car, you're best leaving it parked up and take public transport which will be quicker, cost less and be more relaxing. Badalona is a pretty neighbourhood with a focus on arts. For a long time it used to serve as the industrial part to Barcelona's cultural and tourism hub, but that has all changed. One of the best things to do is to walk along the Petrol Bridge (Pont de Petroli) - It's not really a bridge but more of a pier sticking out 250m into the sea. This used to be an oil tanker offloading rig but was converted for pedestrian use in 2009. 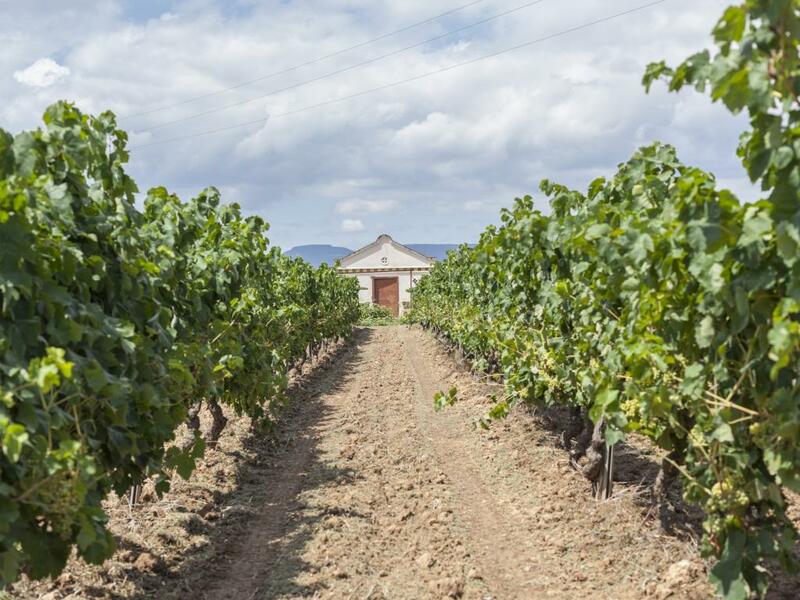 There are a lot of different wine regions in Catalonia and Cava is not too far from Barcelona, but we'd recommend you head a little closer to the less known but equally spectacular Penedes wineries. There are almost 3,000 wine farmers in the Penedes region, but you can drive through it easily and it is within easy reach of Barcelona. As with all Catalan wines, they are named Denominación de Origen (DO) followed by the region so these wines carry the DO Penedes tag. One of the most famous wineries in the region is the Bodegas Torres. They also operate out of a few other Spanish regions and are known around the world for their Torres branded wines. If you want a more local experience, there is a huge choice of smaller vineyards to choose from and a lot of them will offer tours and sell you their produce. 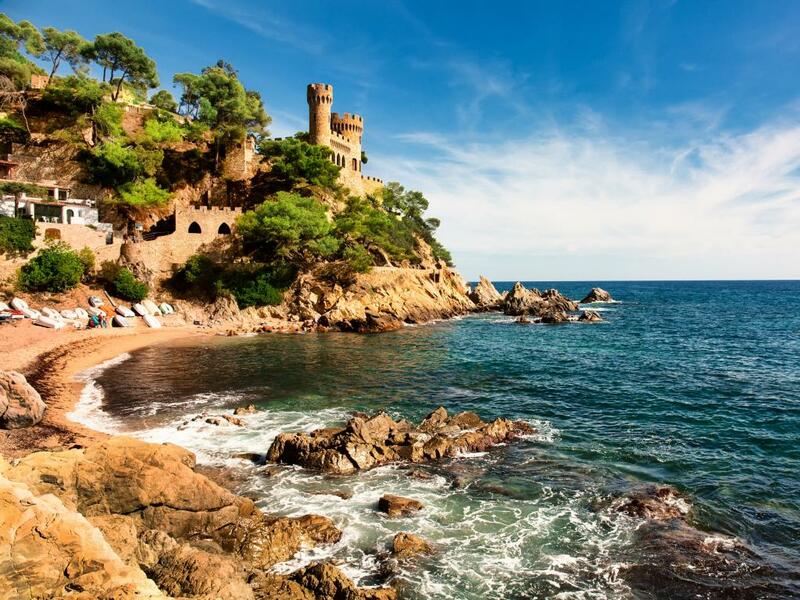 Just an hour's drive from Barcelona, Lloret de Mar is a quintessential Catalan seaside resort. Lloret de Mar is all about the beach. The Lloret beach spans the length of the town and offers a sand retreat from the busy streets of the Catalan capital. You can spend the day resting under a parasol or engaging in the different water-based activities on offer. Lunch is available across the road at one of the many cafes lining the street. If you fancy a walk, there are some great coves that are only accessible via a coastal path. The beach can get busy during the summer, especially at the weekend, so if you want a bit of peace and quiet, it's a good idea to walk a bit further. You will notice that each cove has less and less people offering a more relaxed environment. Tossa de Mar is a little further along the coast from Lloret de Mar is a more relaxed and downbeat sister to Lloret's party vibe. It has a great old town feel about it with cobbled streets and picturesque mountains overlooking from the back. The seaside resort is famous for being the location where Pandora and the Flying Dutchman - the iconic movie that came out in 1950 and put Tossa de Mar firmly on the map. There is a whopping 14km of beaches lining the Tossa de Mar coastline which means that you'll find a spot of sand that matches your wants and needs if you look hard enough. This is one of the best combinations of beach and culture on the Costa Brava so definitely worth driving up from Barcelona if you have a day spare. A couple of miles short of Tarragona is the Cala Fonda beach, locally known as the Waikiki Beach. Named after a Honolulu neighbourhood, the beach is aptly named after Hawaii because of its unspoilt looks and a beautiful cove feel. Surrounded by limestone cliffs, the Cala Fonda beach is a 200m stretch of sand that looks like civilisation hasn't touched it. But you can get there in just over an hour on a day trip from Barcelona! To keep its authenticity and seclusion, there is nothing provided at the beach other than the odd warning sign. You'll need to bring your own umbrella, snacks and drinks and carry them from the Platja de Larga parking area in Tarragona. The Garrotxa Volcanic Zone is a large natural park surrounding the Santa Margarida Volcano. As you approach the park, there are several parking zones that have signs from the road - make sure you park in a designated parking area. 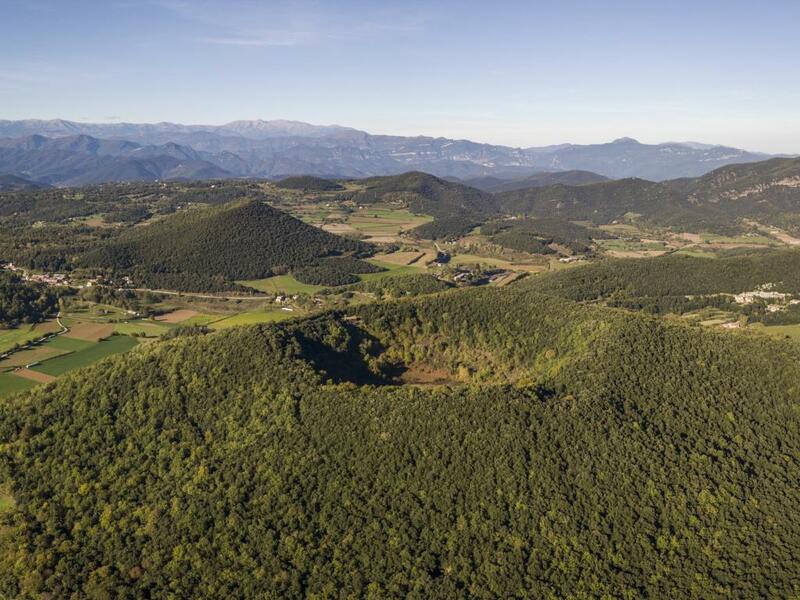 Despite being fully open to the public with good maps and paths throughout, the Garrotxa Natural Park is almost entirely privately owned. This means that you should make sure not to litter, keep the noise down and beware that you should not take rocks or wildlife as mementos. With a lot of amazing historic towns and villages in the area, you might want to get up early and hike around the mountains before it gets hot. You can then head to Figueres, Castellfollit de la Roca or Besalu (see below for all 3) for a much needed refreshment. 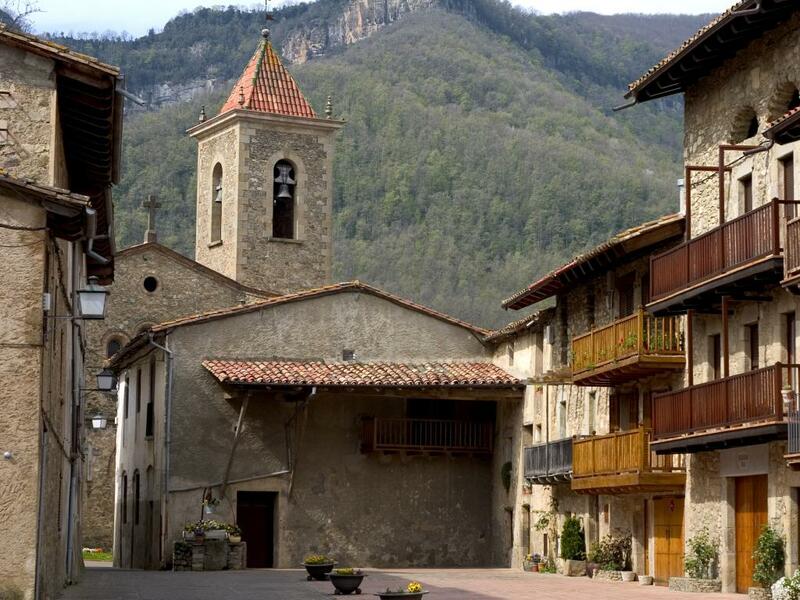 The Cami dels Bons Homes is a route through the foothills of the Pyrenees that was followed by Cathars as they escaped persecution inf France some 800 years ago. Today it is an amazing hiking route that offers breathless views of the mountains, fresh air and as long a walk as you can muster. We don't necessarily recommend you do the entire route - that would take you a few days! But you can drive from Barcelona up to Peguera and hiking around that area. This section has a lot of trees and solid mountain climbs making for a good day out for the whole family. Driving up to Andorra from Barcelona is a bit of a stretch for a 1 day trip, but can be done if you set off early. Alternatively, why not get a hotel and stay over to make it a weekend break? Getting to Andorra is relatively straight forward with good roads and signage all the way from Barcelona. A great place to stop on the way is a small village called Baga - it's full of beautiful stone buildings and fantastic moutnain views. Beware that conditions can be very cold and snowy in the winter so make sure your car and you are prepared! Andorra La Vella is the highest altitude city in Europe but you can see most of the sights in a few hours. There are a few interesting museums dotted around and if you like your shopping, you can buy duty-free good here. Don't get too excited though - there are not a huge amount of shops so unless you're looking for something mainstream, you might not strike lucky. 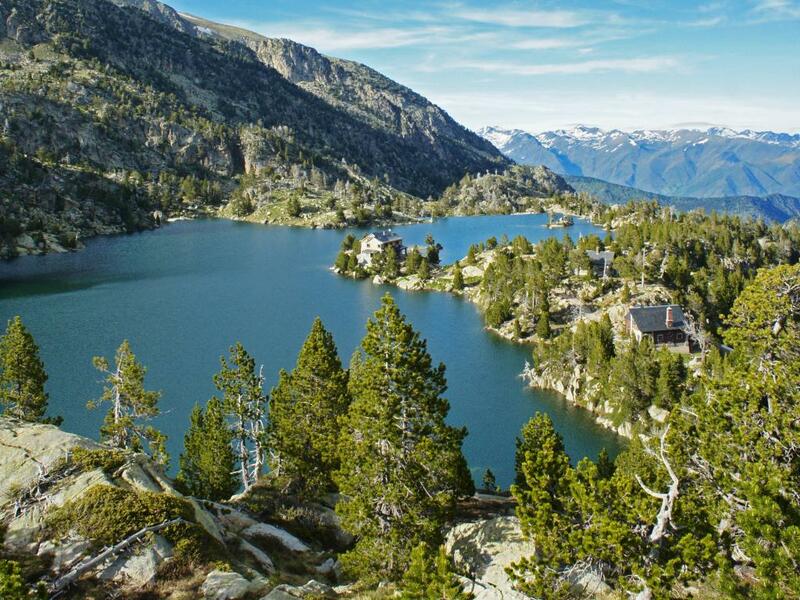 One great thing to do in Andorra if you're coming for the day is hiking - there are a lot of great walking routes around the surrounding mountains and you can pick up great guides at the Tourist Office in the city. 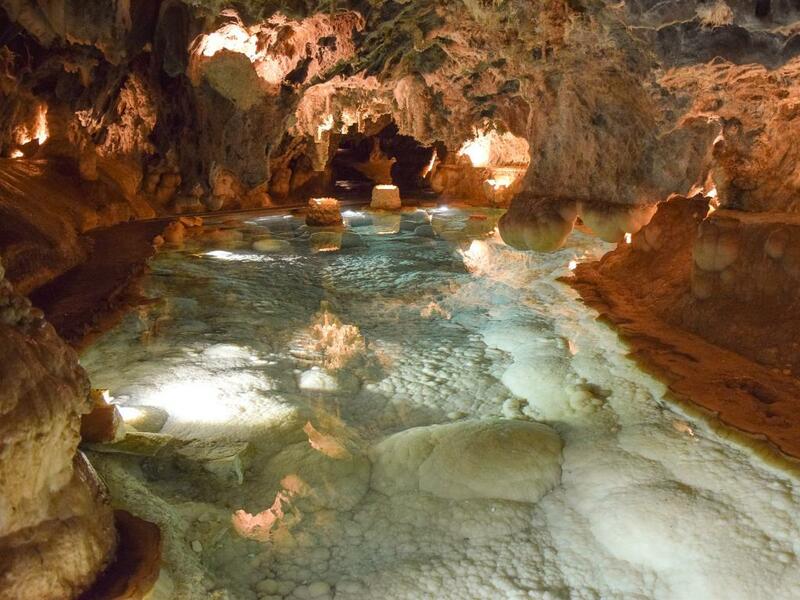 The Benifallet caves are tucked away in the mountains just over 2 hours' drive from Barcelona. The drive up to the caves can be tough as you'll encounter narrow mountain roads, but the views more than make up for it. These caves were discovered in 1967 and have impressive stalactites, stalagmites and all manner of other cave rock formations. The caves are closed between 1.15pm and 4pm for siesta so time your visit to not wait around in the hottest part of the day! These caves seem to have a lot of different names - the Covas Meravelles, Benifallet caves and Las Cuevas Maravillas in case you get lost and need to ask for directions! 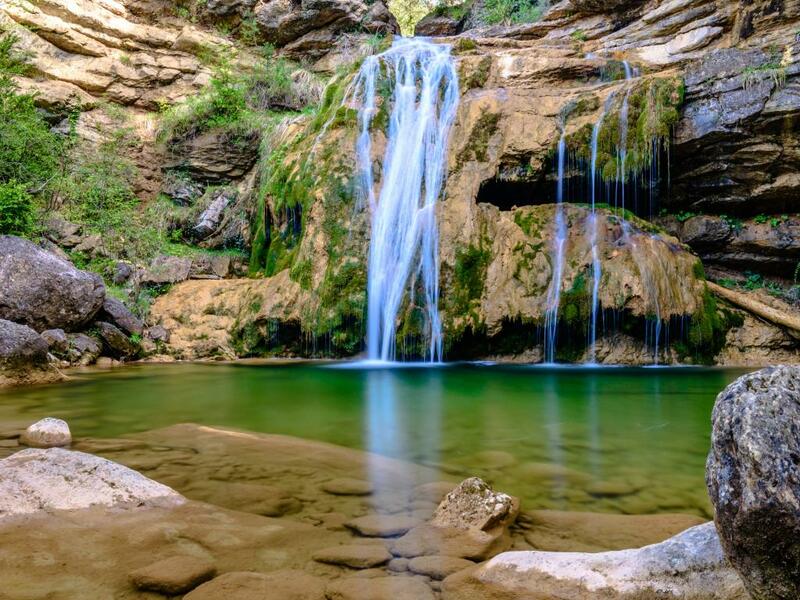 The Cabrera d'Anoia waterfalls are less popular than a lot of other similar treks, so if you're going to go on one trip to the mountain waterfalls, this is a good option that is not too far for a day trip from Barcelona. The route around the waterfalls takes about 3 hours to complete. You need to park up at Canaletes and follow the route around to reach the Salt dels Capellans, Salt del Cargol, Salt dels Cucs and the Salt de la Mala dona waterfalls. The valleys of Anoia are an Area of Natural Interest and you will find it a very refreshing walk to make through the greenery and rocks of these hills. The city of Tarragona is often overlooked on visits to Spain, but this historic town is only just over an hour's drive making it a perfect day trip from Barcelona. 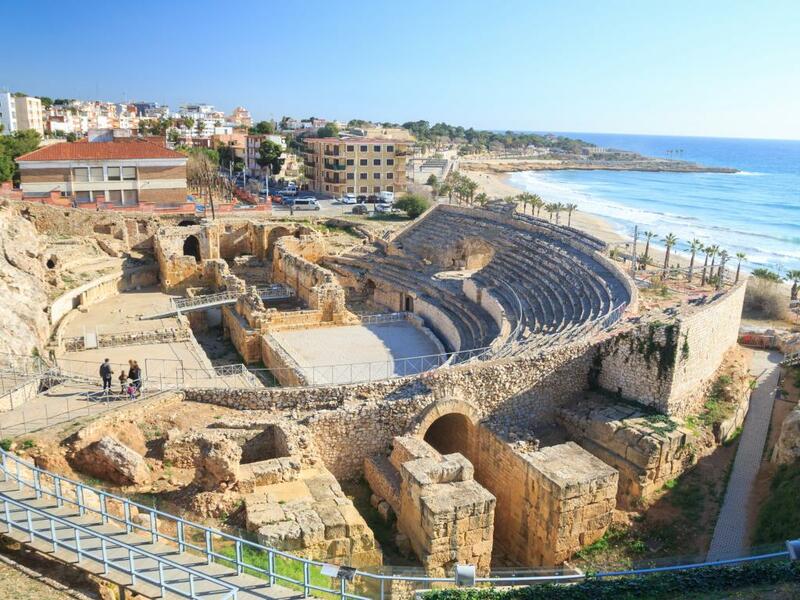 There is a lot of history on show with the Roman Amphitheatre taking up a beautiful spot right by the beach and is a must stop on your walk around Tarragona. To load up on your Roman architecture, there is a giant aqueduct (Pont del Diable) just outside the city near the motorway junction you will come off at - it's definitely worth a stop as it's a spectacular sight and the aqueduct is still in very good condition. 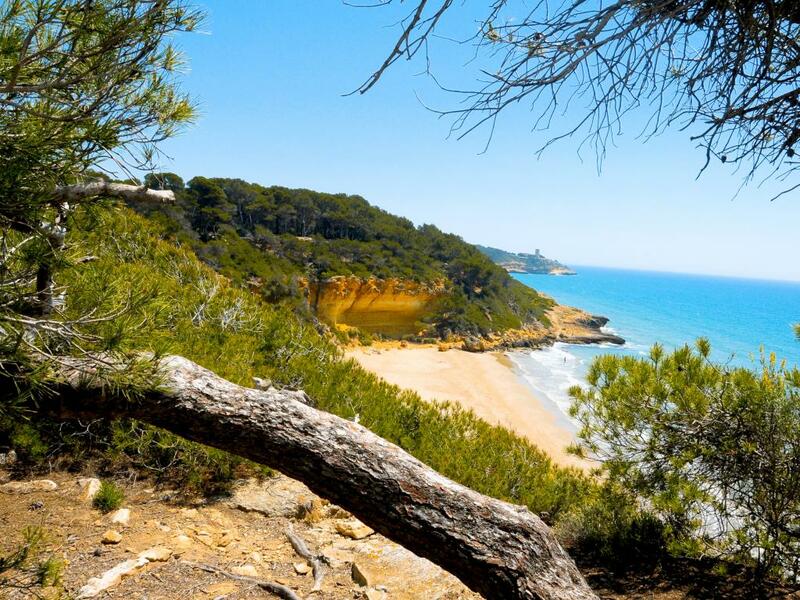 Tarragona is full of spectacular beaches so if you want to mix a walk around the streets with some sunbathing, you will find a selection of great spots to choose from. These can get busy, however, so you might want to make a separate trip to the beach a bit further away from the crowds. Getting to Tarragona from Barcelona is super easy - the drive along the coast past Sitges is a great option compared to the toll road further inland. You can also hop onto the train - there is a good service up and down so if you don't want to venture out of Tarragona's centre, this can be a great choice. Located just south of Barcelona, Sitges is a seaside town that boasts a number of sandy beaches and wild nightlife. There is a historic centre with a number of very decent restaurants, but in recent years Sitges has become a hotspot for partying - there is even a Street of Sin full of bars and clubs and a general bohemian vibe. Having been a resort town since the 1800s, Sitges is known as a popular destination for gay holidays with a tolerant and vibrant night scene. Sitges' particular microclimate means it's sunny almost all year round and it hosts big film, dance and culture festivals. You can easily combine a stop in Sitges with a trip to Tarragona - if you want to have a long day out, you can try one of the highly rated restaurants and eat out in Sitges before making the return drive to Barcelona. 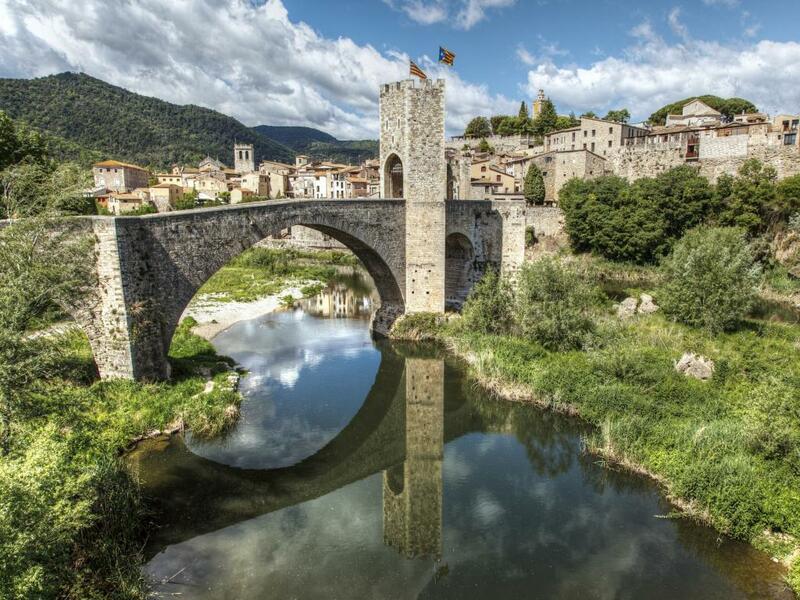 The beautiful medieval town of Besalu is a little further out from Barcelona, but is definitely worth a visit. There is a large free parking area as you get into the town. Once you're parked up, everything can be seen on a short walk. You can start by visiting the Tourist Office right next to the parking. Get a map and see how much history oozes out of every stone. The two main sights are the medieval bridge and the Monastery of Sant Pere. The bridge across river Fluvia is stunning and offers good photo taking opportunities - if you stay late, the sun setting behind the mountains adds a romantic touch. The main remaining part of the monastery is the church. You won't miss it as it sits right in the middle on the Sant Pere square and is surprisingly large for the size of the town. 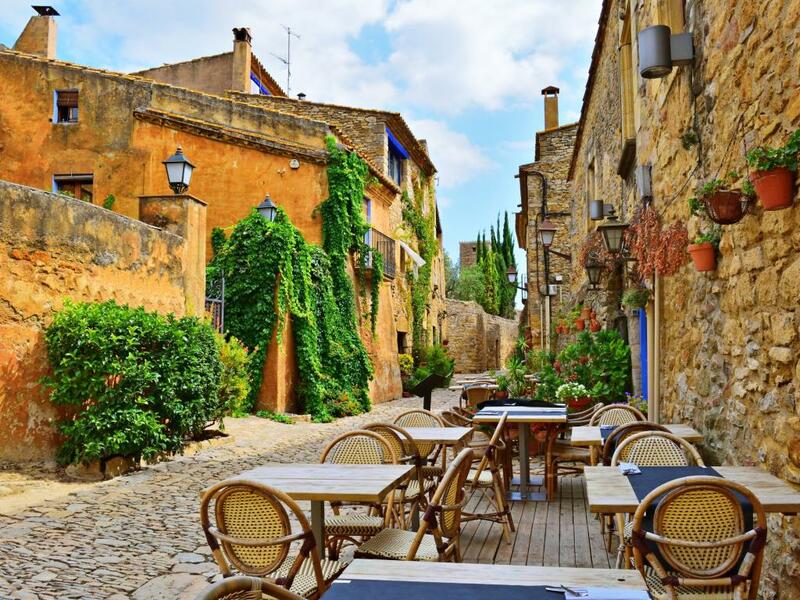 Best thing to do in Besalu is wonder the ancient streets and perch up at one of the cafes for a leisurely lunch - the atmosphere and fresh air make this one of the better days out from the hustle and bustle of the city. 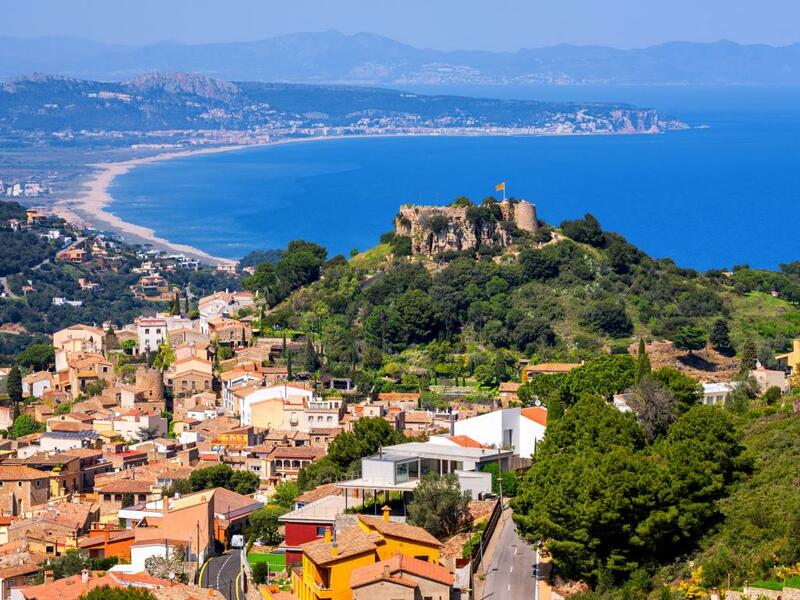 Begur is a seaside town north of Barcelona that is fantastic for a day trip. It is far enough from Barcelona and Girona that relatively few tourists make it but close enough that visiting for a day is easy. 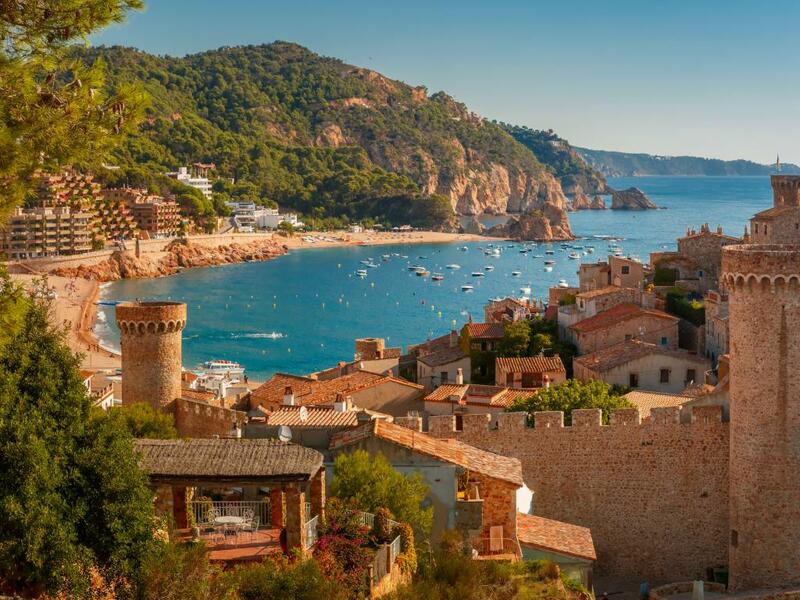 Set on a picturesque part of the coast, Begur has become popular with people who live in Barcelona - there are fantastic bars and restaurants dotted around this historic town that make for a perfect way to spend a weekend. 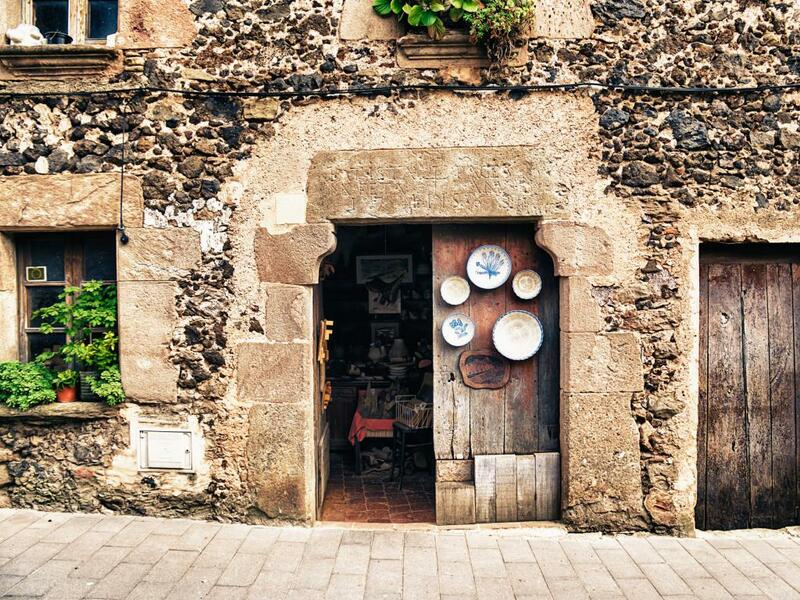 Begur's unusually colourful nature and beautiful beach-side buildings are down to its cultural links with Cuba. A number of locals emigrated in the 19th century and when they came back, they brought a touch of the Caribbean back with them. There are a lot of unique colonial style houses dotted around the town so keep your eyes open as you walk the streets. If you want to earn your lunch, you can visit the castle sitting at the top of the hill above the town. It has been meticulously restored by the residents and caters to disabilities including wheelchair access. If you want to relax a little on a beach, the Platja Fonda is a great local option. There are no real facilities on the beach and we'd recommend you bring flip flops or some other water-friendly footwear, but this is one hidden gem of a beach for spending a few lazy hours in the afternoon. Figueres is well known as the home of Salvador Dali. It is located right in the north of Catalonia, a short drive from the French border but can be easily reached in under 2 hours from Barcelona. Unsurprisingly the main attractions in town is the Salvador Dali Museum. This Teatre-Museum is the largest surrealist object in the world. 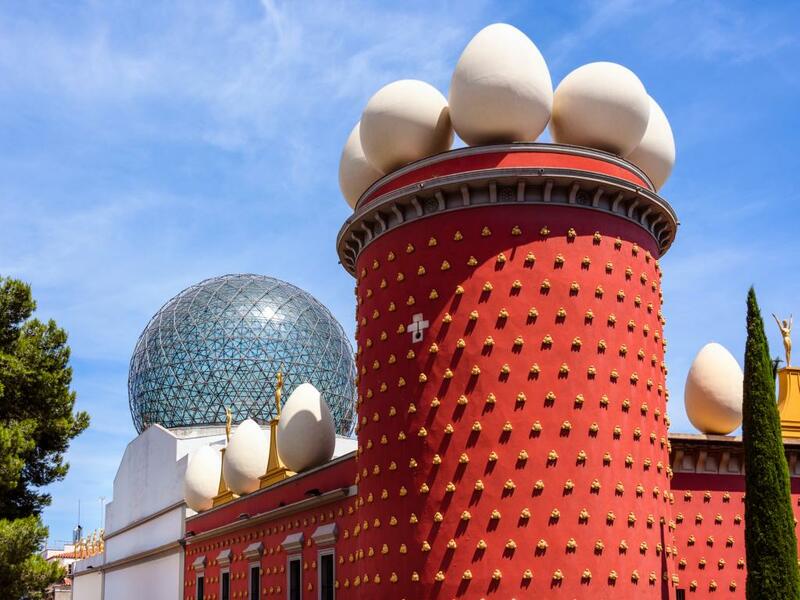 Built by Dali on top of the ruins of an old theatre, it has a distinctive glass dome with large egg-shaped decorations. Dali built this museum specifically to wow visitors with a unique exhibition and the various rooms are filled with one-off Dali pieces, paintings and experiential effects. 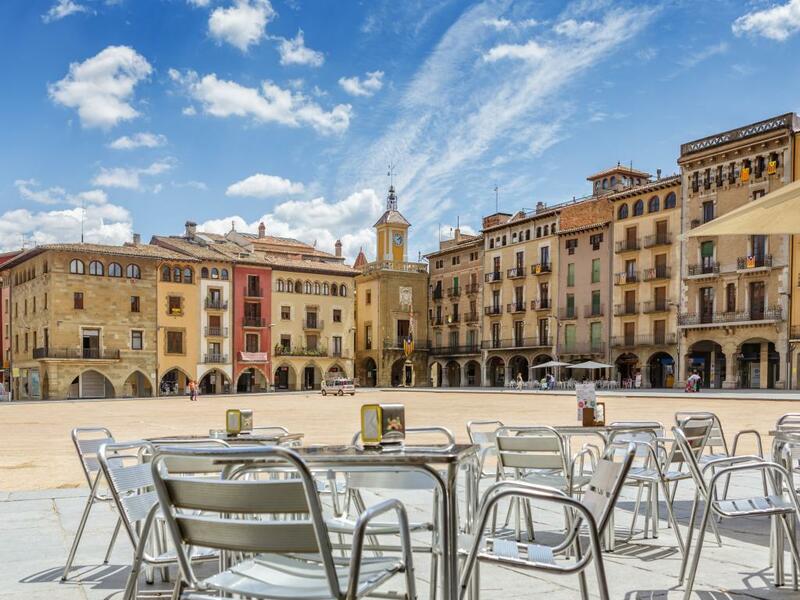 Figueres also has a main street called the Rambla which, much like its Barcelona namesake is a popular spot for meeting friends and sitting in one of the many cafes. There are a number of old streets you can explore just off the Rambla which is a great way to spend the day. 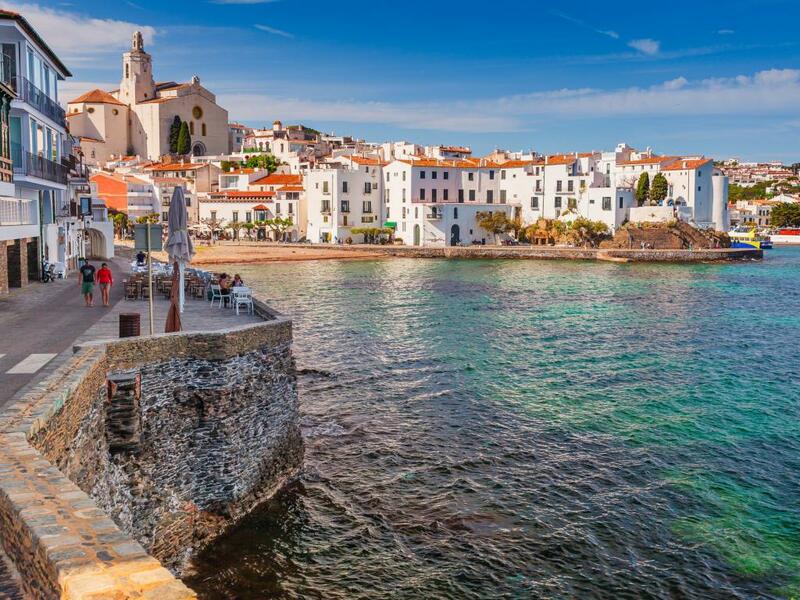 Another town right in the north-eastern corner of Catalonia is Cadaques. Only a short drive to the coast from Figueres and a stone's throw from France, it is a long drive from Barcelona. You might want to combine your visit to Figueres with an afternoon in Cadaques to make the most of your trip up the coast. This charming seaside resort is full of narrow streets, nooks and crannies to explore. The most noticeable buildings are the modernist ones found along the seaside promenade - there is an overarching white theme, but the houses have colourful accents with bright coloured doors, windows and flower boxes. There are some good beaches - Cabo de Creus but these are more pebbly and stony than the sandy beaches further south along the Costa Brava. One sight you really have to visit if you come to Cadaques is the Salvador Dali Casa-Museo (House Museum). It's in the Port Lligat area - a small fishing village which has become a neighbourhood of Cadaques. Salvador Dali lived here for large parts of his life from 1930 to 1982 and remodelled the building over this time. 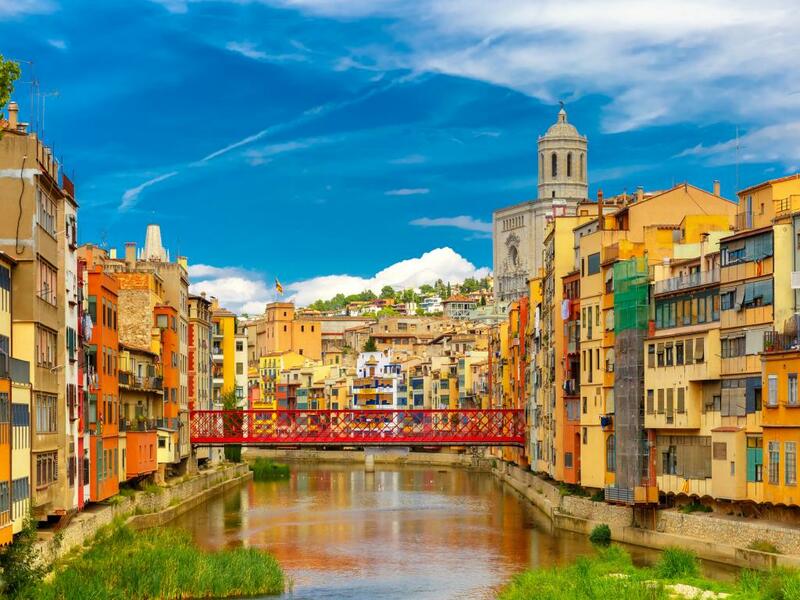 Girona is a large city in northern Catalonia that has a lot of culture and history making it perfect for a day trip at just over an hour from Barcelona. The architecture and feel is quite different to a lot of neighbouring towns - there is a lot more colour and a broad mix of styles here that form into a stunning cultural blend. There are historic sights aplenty - check out the Girona Cathedral with a giant 91-step staircase leading up to it. There is a well preserved medieval Jewish Quarter (The Call) and you can even walk the city walls - there are two restored walkable sections of the Moorish construction. If you want to relax on your way to and from Girona, you can get the train from central Barcelona instead of driving. Trains go from the Barcelona Sants station and only take 1 hour 30 minutes so you can easily go and come back in a day. Tickets cost about €10 per person (will be more or less depending on time and day). Vic is a charming sleepy town only an hour's drive from Barcelona. It is not the first town that gets mentioned by tourists visiting Catalonia, but it has a great ambience and a relaxed feel. The central square - the Placa Major - is where everything happens. There are cafes to sip a mid-morning cup of coffee and 14th century buildings including the Gothic Town Hall. The main tourist sight in the town is the Sant Pere Cathedral. It combines a mix of styles due to restorations and updates since it was built in the 11th century. If you like your museums, the Episcopal Museum has a collection of 29,000 Gothic and Romanesque works. The biggest reason to visit Vic is to sample the local cured meats dubbed the best in Catalonia if not the whole of Spain. The fuet is what you want to try - it's a dried pork sausage with pepper and spices that originates in the city. Montblanc is a magnificent fortified city in the Tarragona province and no - it's not Europe's tallest mountain. At least not this Montblanc. You can park up outside the city walls and explore the town on foot. One of the gates into the city, the St Jordi gate, is the spot where Saint George slayed the dragon - a feat the city celebrates every April. The entire city is a medieval masterpiece with a lot of buildings dating back to the 14th century. The centre of the town is the Placa Major and there is a lot of historic sights including three Gothic churches (Santa Maria, Sant Miguel and Sant Marcel). A large part of the original city wall is still standing and is worth walking along to see the towers and battle stations. The Carrer dels Jueus is home to the town's Jewish Quarter which seems to amplify the overall charm of the town even further. 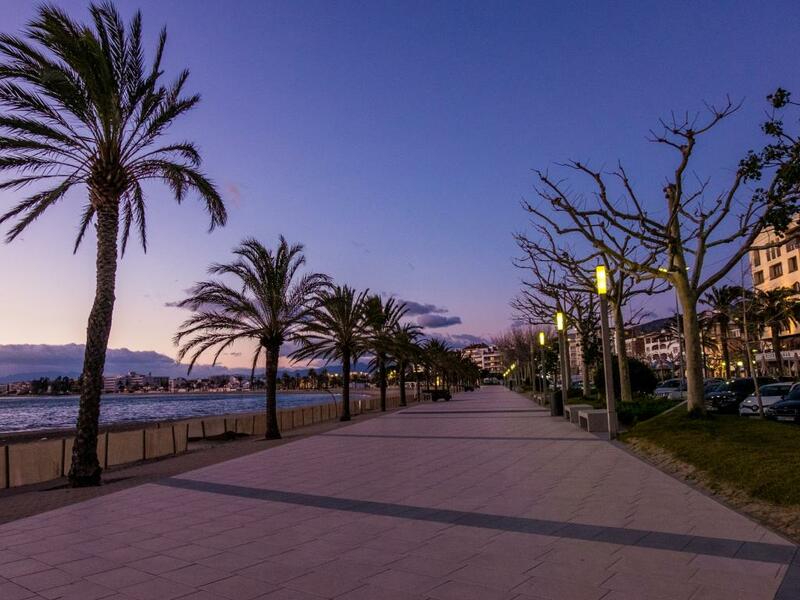 L'Escala and Sant Marti d'Empuries are neighbouring seaside resorts that you can walk between in a few minutes. Sant Marti d'Empuries is a pretty village and much smaller than its neighbour. You will find a lot of charm and the centre is packed with restaurant tables in front of an 11th century church. L'Escala has a great Old Town but is a bigger resort with beaches and an ancient port. In-between the two are the Empuries ruins. An ancient Greek and later Roman town were here since 600 BC. A few columns and stone artefacts remain and it's a good stroll from one of the two towns either side. 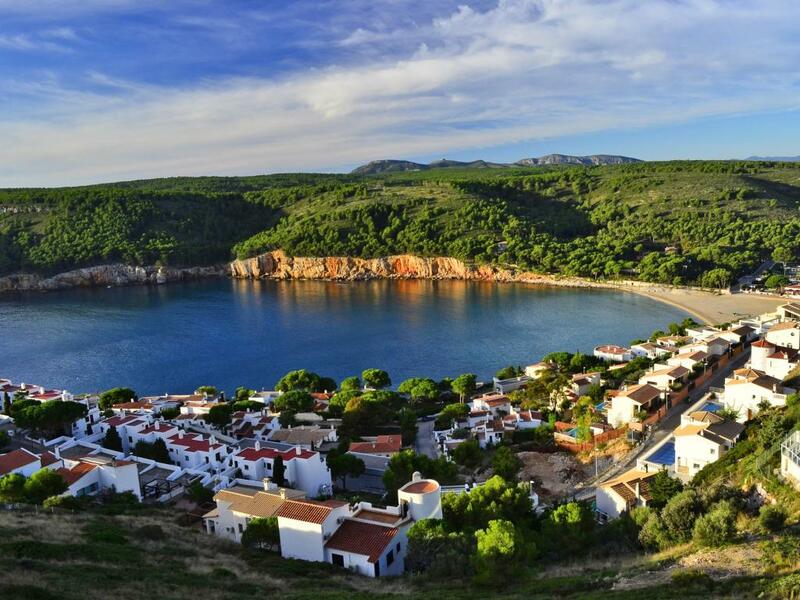 Across the Bay of Roses from L'Escala is the resort of Roses and it is very much worth visiting in its own right. Roses offers a selection of different beaches and coves. The beach of Roses an the Punta beach offer all the ameneties you might want and crystal clear waters. Wander a little further and you'll find a number of stunningly beautiful coves along the waterfront of Cabo de Creus Natural Park. These tend to be a lot quieter than the main beaches, but don't offer much in the way of services. Two historic sites in Roses that are worth seeing are the La Ciudadela fortress and the Trinidad castle. Both are little more than ruins, but the fortress is very spectacular in size for an 11th century installation. 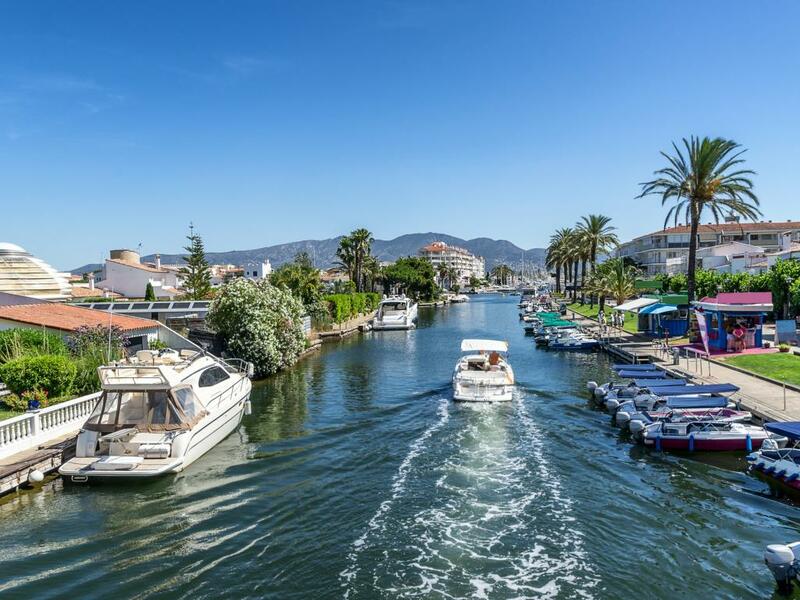 Located between the two seaside resorts above (Roses and L'Escala), Empuriabrava is like nothing you have seen along the Costa Brava or any Spanish costa for that matter. This is the largest marina in Europe which has 23km of canals and berths for 5,000 boats and yachts. These canals run through a neighbourhood of expensive and pristine houses that make you feel like you're in Miami rather than Spain. Believe it or not, there is a medieval town centre, but that's not what Empuriabrava is all about. Head for the cafes and restaurants and enjoy a spot of people watching. 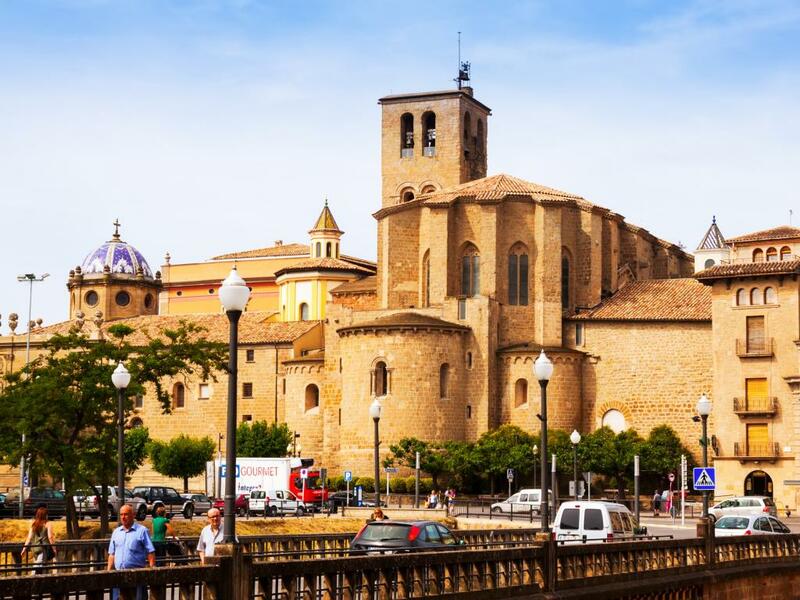 Solsona is a town about an hour and a half out from Barcelona that is most famous for its cathedral. The 14th century Cathedral of Santa Maria has a mix of styles over the centuries in which it was built and modified. 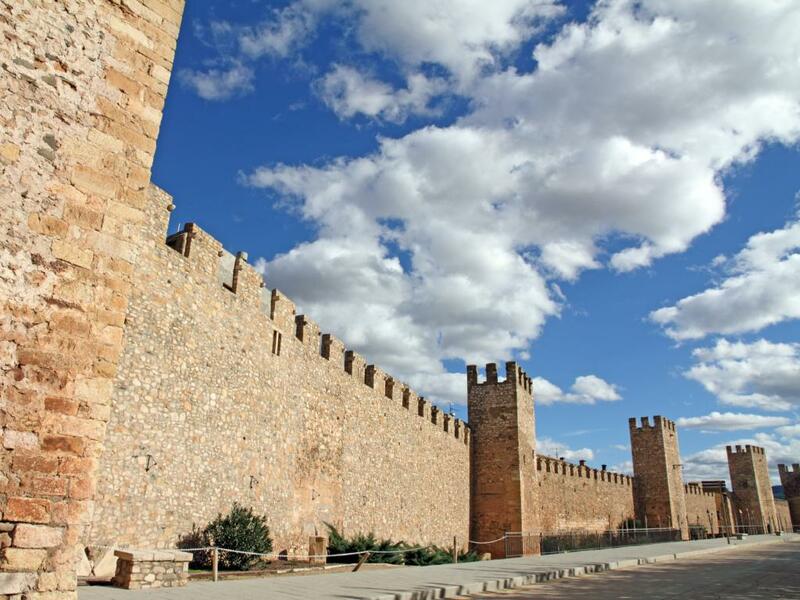 Originally Solsona was a walled city and you can still visit the three entrances that have been preserved - del Pont, del Castell and de Llobera. A small amount of the city wall is also accessible. 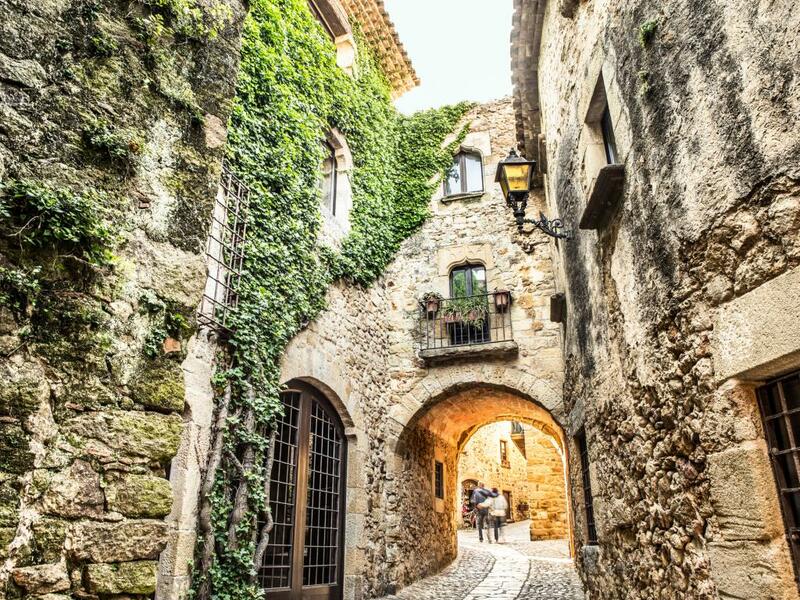 With it being a fair drive and a lot of other options available, Solsona is great to visit once you've ticked some of the mainstream day trips from Barcelona off your list. If you happen to be visiting in early March, Solsona holds a week/9-day long carnival which is one of the best in the country. This tiny village sits between Barcelona and the town of Lleida to the east. With a population of only 200, it is a very small place but you will love the cobbled streets and architecture. There is even some ruins of an old castle and a pretty church of Santa Maria. If you're like us and love finding gems off the beaten track, this is one of them. There is an entrance gate to get you inside the walls of the city and admire the views that the locals enjoy of surrounding countryside. There is even a restaurant in the centre of the village imaginatively called Restaurant Centre - we bet you won't miss it. Even if you don't want lunch, it's a great place to stop and enjoy a drink on a hot summer day. Rupit is a picturesque village in the mountains north of Barcelona. If you love old stone buildings, cobbled streets and meandering narrow streets, this is the place for you. Walking around Rupit, you may feel like you have moved back in time. Most of the village looks like it probably did a few hundred years ago. There is a river flowing by, waterfalls through the village and a lot of steep inclines. There are a few places to eat so if you're coming from Barcelona for a day, make sure you grab some lunch here. The air is clean and birds often soar overhead as you eat in the heart of Rupit's medieval streets. Santa Pau is a small town in the Garrotxa Nature Reserve. It was originally built as a fortified stronghold to protect against invasions and over time grew into a popular destination full of medieval stone buildings. In 1971, it was granted protected heritage and artistic status. The town is built around its central square and medieval castle. Everywhere you look, the 13th and 14th century buildings are all made of stone and there is a plethora of arcades, arches and narrow walkways throughout the town. The main square also houses the Santa Maria church which is worth a visit. There is a golden altar and although the church is older than much of the rest of Santa Pau, it is still a 16th century building which offers a lot of insight into the history of the town and its culture. Near the seaside resort of Begur (see above! ), is the small fortified town of Peratallada, just under a 2 hour drive from Barcelona. This is not a big town, so you might want to visit Peratallada in the morning and then head to the sea to have your ice cream when the sun gets hot. The unique village is made of stone that was dug up to make the moat around its fortified walls. There is a mix of beautiful stone buildings, some going back as far as the 11th century. Pals is another stone village and is also an hour and 40 minutes drive from Barcelona - nestled between Peratallada and Begur. If you love an early start, you can probably fit all three in on a single day out of Barcelona - I'd suggest you visit the mountain villages first and head to the beach when the sun is directly above and you need to jump into the sea. You will see a tower as you drive up the mountain towards the village - this is the last remains of what was a castle in the past. There are four towers in total for you to explore and you can also pop inside the Gothic church. Siurana is a small village sitting on top of a sheer mountain cliff in the Prades mountains overlooking the Siurana reservoir. Siurana's spot in the Priorat region offers views to die for which is fantastic, because that is the main (and only) attraction. This is a small sleepy village which has been slowly restoring itself over the past decades, but it is by no means a tourism hub. There is one restaurant in the village with a few more down the road leading up to the village if you want some lunch. The Cornudella de Montsant village lower down has a few wineries you can visit (some require a 4x4 vehicle to get in) which is can make a fantastic day trip combined with visiting Siurana. Els Hostalets d'en Bas is an unassuming small town, originally formed in the early part of 18th century as a stopover en route from Vic to Olot. Today it is a peaceful mountain side town that has unique architecture for the region that will remind you a little of American towns with its straight wide streets and house layout. The construction is still unmistakeably European with stone buildings and wooden balconies being the theme. Els Hostalets has been declared a National Artistic Monument so if you're driving around the area, you should definitely consider a detour. We wouldn't spend the whole day here as there isn't all that much to do or see so combine this with visits to Vic or Santa Pau to make it a full day out. 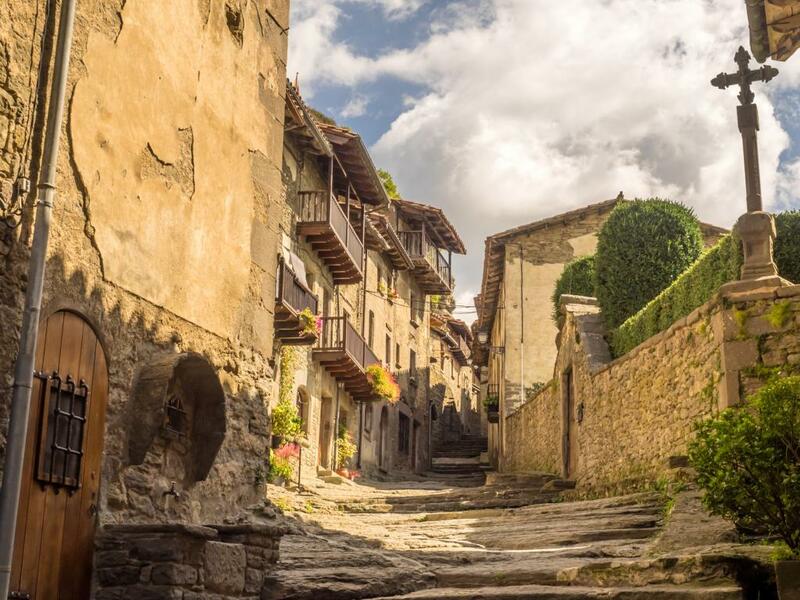 Located near the French border along the road between Ripoll and Figueres, Castellfollit de la Roca is one of the most stunning villages in Spain due to its medieval architecture and position on top the sheer rock. Similar in some ways to Ronda in Andalucia, Castellfollit is fully of history and charm. You can visit the Old Town and the church of Sant Salvador. The church was built in the 11th century, but is not currently functioning. There are a few local restaurants offering local foods including great mushrooms and a locally brewed craft beer (Poch's). 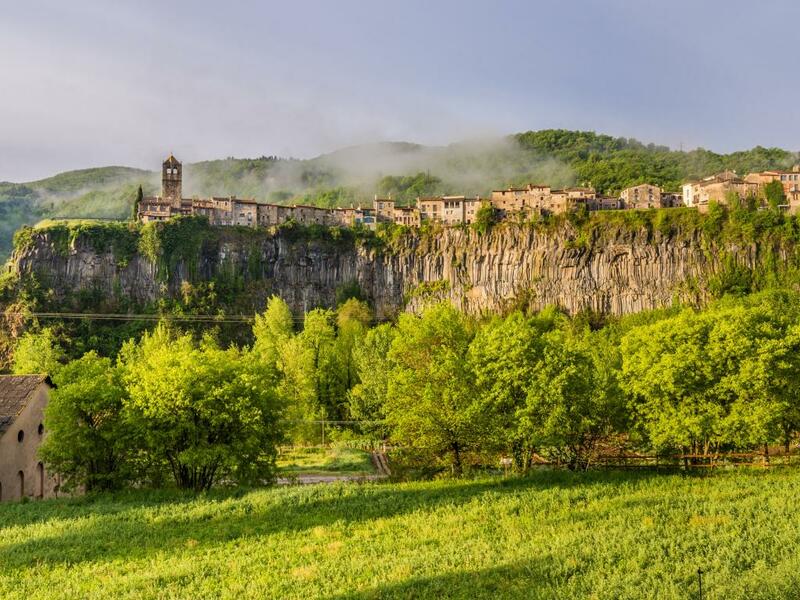 As Castellfollit de la Roca sits right in the middle of the Garrotxa volcano region, it's a good idea to take the time to explore the area and find a good place to hike if you're coming for a day from Barcelona. 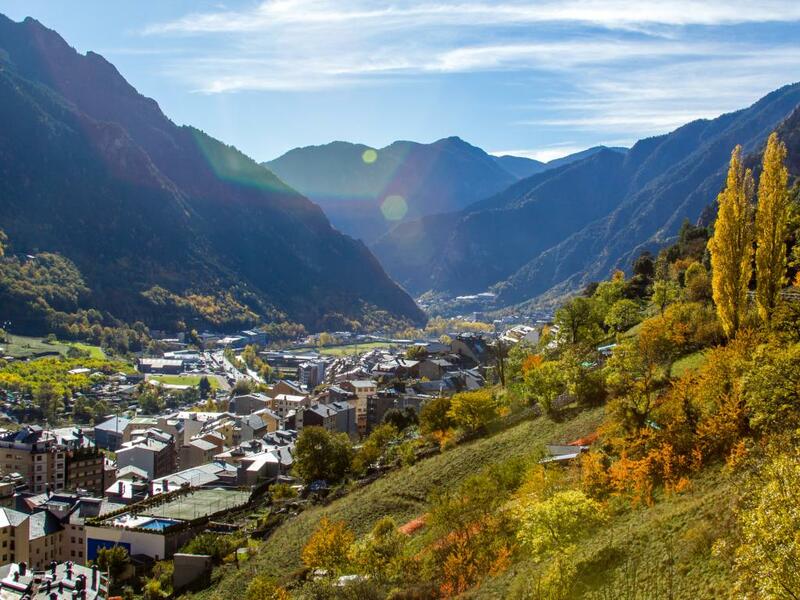 This small but historically important town is just south of the border with Andorra and sits on a plain overlooked by the Pyrenees. The medieval town is a good stop on the way to Andorra or a visit in its own right - it grew and prospered as a town on main trading routes through Europe and has a lot of historic buildings. The main sight in the city is the Santa Maria Cathedral. This is an impressive 12th century Romanesque cathedral with a lot of features that have been updated or replaced over the centuries. Adjoining the Cathedral is the Diocesan Museum. Make sure you visit to see a lot of amazing art, a Gothic altarpiece and a collection of Romanesque images of the Virgin Mary. If you want to take a longer walk, there is the Valira park alongside the river which can be a great stroll before heading back into the city. A 2-hour drive down the coast from Barcelona will take you past Tarragona and to the delta of the Ebro (or Ebre - Spanish and Catalan names) river. This is the second largest wetland area in Europe and is a Spanish natural park. 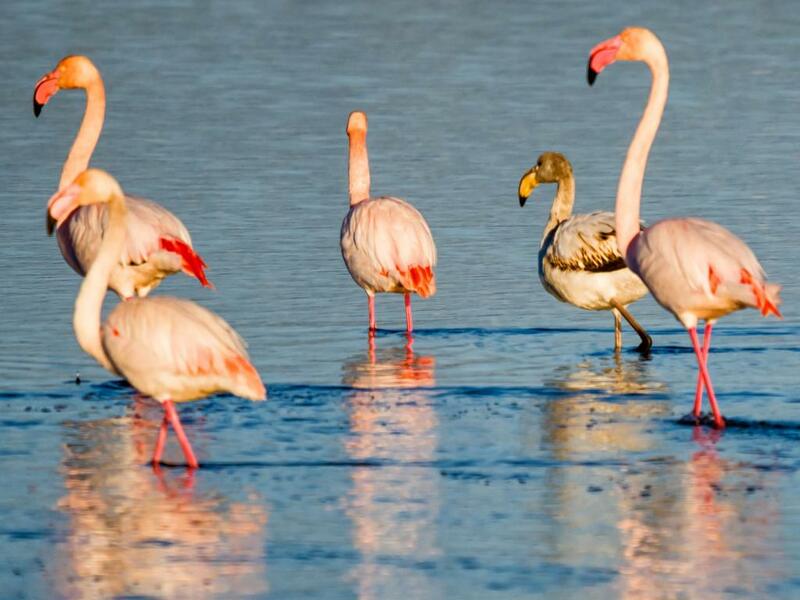 The Delta de l'Ebre is home to over 300 species of birds who love its marshes, streams and dry lakes. Even if you're not much into bird watching, we are talking a unique opportunity to see a lot of flamingos, raptors, herons and ospreys as well as migratory birds from around the world. The local farmers have giant rice paddies and there is a great selection of places to eat at L'Ampolla - the town you will pass through as you enter the delta. To make the most of your day trip from Barcelona to Zaragoza, you really have to get up early and beat the traffic. Get on the road and aim to get to Zaragoza in time for brunch. Zaragoza is the capital of the Aragon region that neigbours Catalonia. This is a big city and there are a lot of options on how to spend your day. 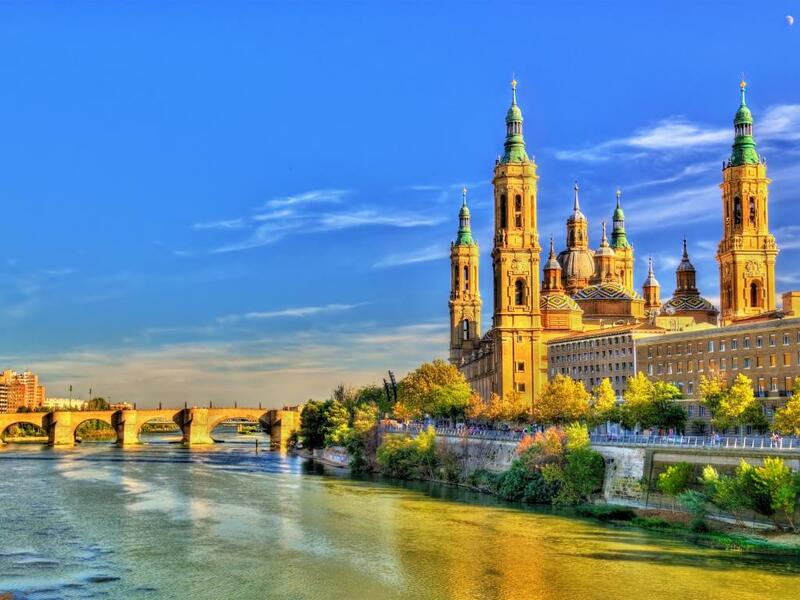 If you love history and culture, Zaragoza has a lot for you to see. You can visit the Aljafería Palace which is one of the best pieces of Moorish architecture in Spain or visit the Museo Goya to check out a collection of 250 works by Goya, an infamous romantic Spanish artist. Best thing to do, as with most Spanish cities, is to roam around the streets and enjoy a spot of people watching from a cafe. Get yourself some churros (particularly good here) and visit the Basílica de Nuestra Señora del Pilar in the afternoon - this is a fabulous Cathedral which is famous for a story of the Virgin Mary appearing in front of St James the Apostle in AD 40. For the more adventurous type, the Campdevanol Waterfalls are a unique set of 7 waterfalls and water pools that are linked. You can drive and park up near the falls, but remember that you'll need to pay €10 to kar your car. There are a lot of sheer climbs, sharp rocks, slippery surfaces and other kinds of danger on this route. I would urge you to not take babies or young kids with you on this one. The water in these falls comes through springs and mountains streams which means the pools are cold. Think really really cold - they are a bit colder than that. Despite the long drive, the need to trek and the cold water, these falls can get really busy so if you want to avoid mingling with dozens of other people in each pool. try to set off from Barcelona early to get there early in the morning. Avoid weekends as that's when the locals descend from neighbouring towns. You can swim in all of the pools and enjoy the place to yourself before everybody else gets here! 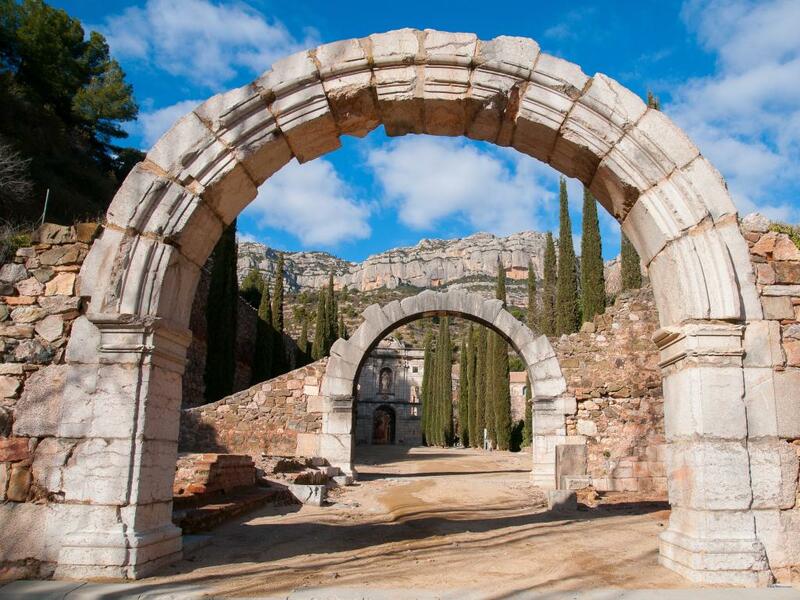 The Carthusian Monastery Santa Maria of Escaladei is a ruin of one of the most important medieval monasteries in Spain. It was formed in the 12th century by the order of King Alfonso I in an attempt to bring Christianity to the Muslim community of Catalonia. The majority of the monastery is an old ruin, but recent work means that one of the cloisters has been rebuilt and you can also visit the church and the refectory buildings. 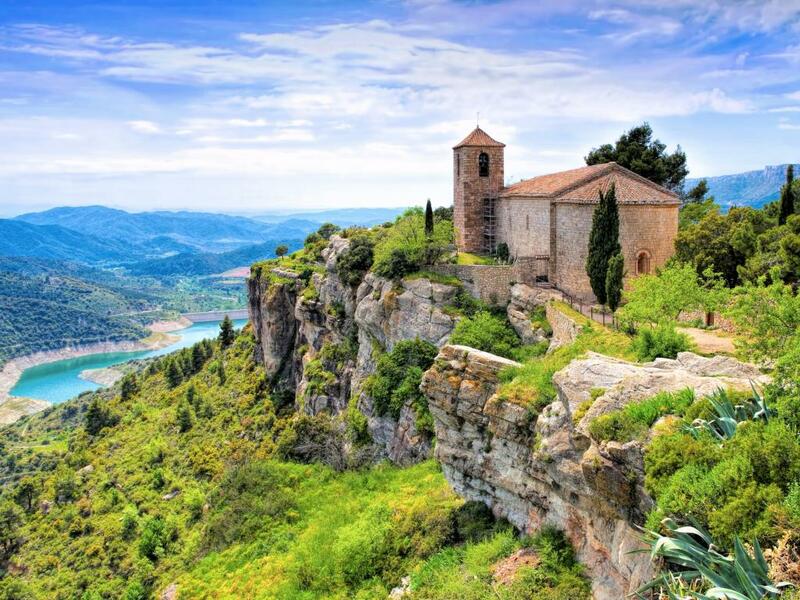 If you're driving all the way to the Escaladei monastery, it's a good idea to couple it with a visit to one of the stunning neighbouring villages such as Siurana. This will also give you the perfect excuse to drive around picture perfect small mountain roads in one of the prettiest parts of Catalonia. What age do you have to be to drive in Europe? Sign up to receive new trips and travel tips! Please note this will include promotional and marketing content. LazyTrips is a trading name of Strategy Desk Ltd.